Extremly smooth detialed and very very musicaly focused.I found the soudstage to be large and sweet in the upper mid region. The bass is so well controlled I find myself woudering how in the heck well you'll get idea. 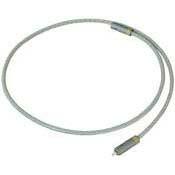 I was looking for digital cables that whould eliminate the bright sound that my system was producing. AT this point my dealer told me to try the VSD-4 coaxal cable. After about 100 hours of play time this cable transformed itself into a masterpeise.The brightness is no longer a problem and now I get the chance to hear the seperation of the instruments and the kind of bass that is tight as a sludge hammer. I'm getting so much detial from this very musical cable that I can give it 5 stars for being atrue high end cable.